Congrats to beardy on being the lucky winner of the Manny Machado 2011 ITG Heroes & Prospects Baseball “Hits” Series 2 Lumbergraphs autographed card. Once beardy sends me his mailing address I will mail this card out ASAP. Alright you prospect collectors. 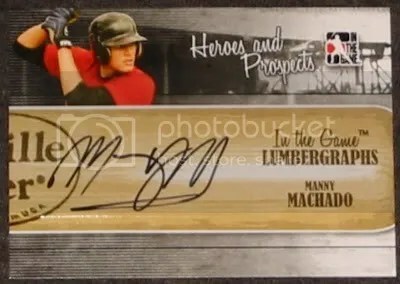 I’m sure many of you would like to add this Manny Machado 2011 ITG Heroes & Prospects Lumbergraphs autograph to your collection. Here’s your chance. Good luck!! !